When Sjölander da Cruz Architects sought to turn an old abestos-clad shed into the firm’s new studio, it offered the perfect opportunity to put an enthusiasm for passive house design into practice. What better way for an architecture firm to break into passive house design than by creating its own passive-certified architectural studio? Birminghambased Sjölander da Cruz Architects had bought an old asbetos-clad agricultural shed near Leamington Spa, and planned to retrofit it into the practice’s new offices. “We just wanted to create something that was a comfortable working environment,” says project architect Shely Begum. 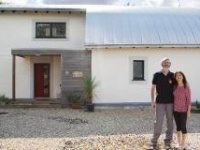 The Sjölander da Cruz team embraced passive house principles from the outset, and aimed for Enerphit certification, the Passive House Institute’s retrofit standard. Arden Construction was appointed as contractor — it was their first passive project too — while energy consultant Nick Grant of Elemental Solutions came on board to advise the team. The existing shed had a north-south orientation, ideal for making the most of passive heat gains. The building is in the green belt, so the existing shape and volume had to remain, but the simple form lent itself to passive design, minimising the external surface area from which heat could escape. First, a specialist subcontractor removed the asbestos cladding from the old steel frame structure. Some of the steel beams were in a bad state too, and needed refurbishment. Sjölander da Cruz chose to keep the existing concrete slab, but wanted to construct two internal mezzanines. This meant there was little room to beef up the floor insulation without limiting headroom under the mezzanines, so only 120mm of phenolic insulation was installed on the slab. 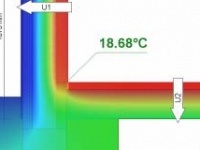 To reach the Enerphit standard for heating demand, the team now had to push the thermal performance of the walls, roofs and windows even further. For the walls, the new thermal envelope consists of Kingspan Tek structural insulated panels (SIPs) outside the existing steel frame. The panels consist of urethane insulation sandwiched between two layers of OSB. 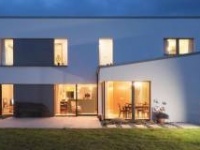 Sjölander da Cruz has extensive experience with SIPs, so it was the natural choice of building material. To boost the U-value further, 100mm of Kingspan Insulation UK Thermawall urethane insulation was installed outside the panels too. The old steel beams run right from the concrete base up to the roof, so wrapping the perimeter in EPS below ground cut thermal bridging here. Meanwhile Kingspan Unidek Aero SIPs — which contain graphite EPS insulation sandwiched between two layers of particle-board — form the insulating layer for the roof. The airtight wrap of the building is formed by the damp proof membrane (DPM) under the floor insulation, the internal OSB for the walls, and a Siga Majpell membrane under the roof panels. Siga tapes were used on all the critical junctions, and lots of taping was required around the tricky junctions between the DPM and the steel columns. An early airtightness test showed some air leaking through the OSB, so wet plastering the walls inside provided an extra seal. The final blower door test result was 0.4 air changes per hour. Harwood says the support available from Nick Grant and Siga was vital to the success of the build. “I think it went relatively smoothly. There were more issues with drainage than there were with anything else,” he says, adding that everyone on the team was eager to embrace passive house. “It was something new, it was something different, it’s a fantastic setting.” He says he would happily take on another passive house project. The studio is heated with a gas combi boiler that supplies underfloor heating. Meanwhile a Paul Novus system provides mechanical heat recovery ventilation (MVHR), and was installed on one of the mezzanines. Extensive glazing on the south and north facades provide natural cross ventilation too. As well as bringing in daylight and fresh air, these windows frame the surrounding countryside, and a wildflower meadow on the site. 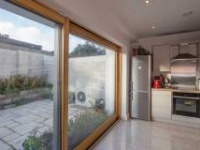 Having lots of glass could risk leading to overheating and glare, but the external insulation creates deep reveals to mitigate this, and there are brise soleils externally on the south and west facades. Pushing the U-values of the other building elements even further compensated for any excess heat loss through the north-facing glass. Along with the ventilation ducting and electrical wiring, the old rusted steel frame is exposed inside. This creates a striking contrast between the white walls and wood finishes. Externally the building is clad with western red cedar, accentuating its warm, natural feel. Sjölander da Cruz moved into the building in January, and named it River Studio, for a tributary of the Avon that runs along the edge of the site. In September the firm began a year long programme of post-occupancy monitoring. “In the summer we’ve noticed that even when it’s quite warm outside, it still feels comfortable,” Shely says. In winter, she adds, the expanses of south-facing glass bring both heat and light into River Studio. Building type: retrofit of mid 20th century asbestos-clad shed into modern architectural studio. Windows & door: Internorm HF200 aluminiumclad timber units. Overall U-value: 0.8 (for standard sized window). Heating system:Worcester Bosch Greenstar 28CDi compact condensing gas boiler (space heating and hot water). Green materials: Western red cedar cladding.